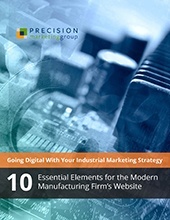 Learn the 10 most important attributes to include on your manufacturing firm’s website – and how you should be leveraging them to effectively market to your customers and prospects. Do you feel like your industrial manufacturing firm is a digital laggard? Long gone are the days of simply relying on a combination of reseller channels and “traditional” marketing tactics (like print advertising and your yearly lineup of trade shows and events); and the trend that’s swept the industrial sector by storm is: manufacturing firms are going digital. Very digital. In most cases, this doesn't mean you need to overhaul your entire current marketing program. You simply need to wise up your company website with the right elements. And we’re here to help! New pages and modules you should be adding to your website to improve user experience. Content marketing advice specific to manufacturing industry professionals. Ways you can use your website to showcase your expertise and credbility. Plus, plenty of statistics and hard facts to back up these key recommendations... and more! Ready to take your industrial marketing strategy to the next level? Simply fill out the form to access our free eGuide now!